The whole world now knows what anyone who has ever been to Turks & Caicos has always known: Grace Bay beach on the island of Providenciales is the number one best beach in the world. While Grace Bay is regularly named one of Trip Advisor’s Travelers’ Choice Beaches, this is the first time it topped the list. This year’s awards ranked 343 beaches and took into account the quantity and quality of traveler reviews over a 12-month period. Other beaches that made the list include Brazil’s Baia do Sancho, which won last year, Playa Paraiso in Cuba, Anse Lazio in Seychelles, and Cayo de Agua in Venezuela. While all the beaches on the list are beautiful, the #1 beach in the world based on Travelers’ Choice is Grace Bay Beach. “Unbelievably clear, clean water with hundreds of shades of blues and greens and white sugar sand beaches—ahhhhh!” one fan of the beach wrote in a review. “The perfect beach, on a perfect island,” another reviewer wrote. Grace Bay is located on the North Shore of Providenciales (Provo), the most developed island in the Caicos. Its public beach features four miles of soft white quartz sand, crystal clear turquoise water, and a long coral reef just off-shore. It is perfect for snorkeling, water sports, swimming, shell collecting or simply strolling. 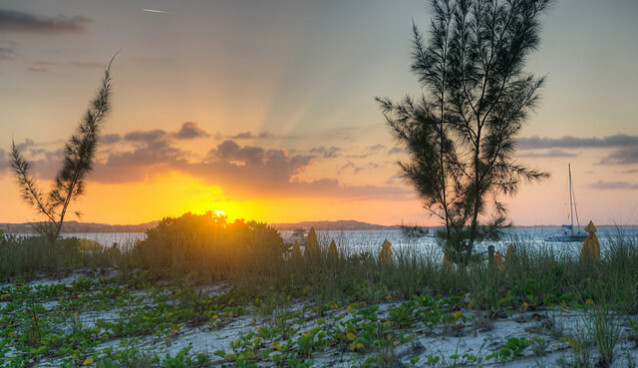 The beauty continues into the evening — Grace Bay is also known for its stunning sunsets. For People who live in New York, Providenciales is a three hour direct flight out of either JFK or Newark. During the summer months it takes less time to get there then it takes to drive to the Jersey shore or to the Hamptons in Long Island on a Friday afternoon. Once you arrive on the island, the beach is a fifteen minute car ride from the airport. To get a comparable beach anywhere in the Caribbean, a boat ride or hopper flight is necessary. Upon arrival at one of these more remote beaches there are usually few amenities or comforts. There are many upscale resorts and villas located along Grace Bay beach, catering to both couples and families. The Blue Haven Resort, The Tuscany and the Regent Grand were ranked on Trip Advisor’s list of the top 25 hotels in the Caribbean. My favorite is the more casual Alexandra Resort with its long stretch of prime beach frontage. Some of the island’s best restaurants are also located along Grace Bay. In fact, Providenciales has more Zagat rated restaurants than any island in the Caribbean including St. Barts which is renowned for its good food and for “Hamberger in Paradise,” of course. The Coco Bistro usually requires a reservation a month in advance, but the Mango Reef, Tiki Hut, and Asu offer outstanding island cuisine with plenty of outdoor seating. While it is one of the most populated areas in Turks & Caicos, Grace Bay rarely ever feels crowded. It is not difficult to find a secluded area and waking the beach to check out the different hotels, bars, and restaurants is part of the fun. After all is said and done, a Caribbean vacation is all about the water. Grace Bay Beach is unsurpassed with its 26 shades of blue, reflective white sandy bottom and water that is so clear that you can always see your feet even when the water is over your head. The water is warm and the snorkeling is superb. Diving in Turks and Caicos is amazing as well. The barrier reef that protects the beach three quarters of a mile off shore is the second longest barrier reef in the world. There is a shelf off the reef where the ocean bottom drops to a staggering depth thereby attracting all kinds of interesting and beautiful aquatic life. In February you might even see a whale cresting as these beautiful creatures follow their annual migration pattern.